A delicious and interesting malt! 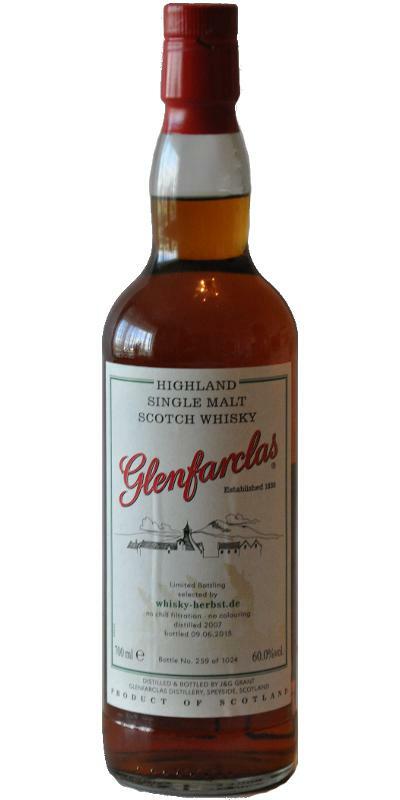 The sharp, shaped by gunpowder note in the taste and aftertaste takes some getting used to, but gives this bottling a special character and makes me this malt. 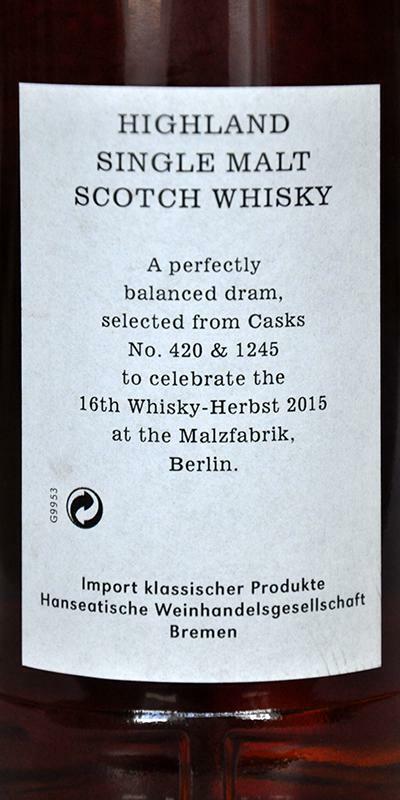 The nose is extremely sweet and goes in the direction of "Schnüffelwhisky". A great and high-contrast whisky, I like it very much! Briefly, dark fruit flavors rest in the mouth before spicy wood elements hit the palate after the first sip. A load of pepper explodes on the tongue, it tingles and tickles in the entire mouth area. After the charge of gunpowder slowly fades away, hazelnuts, burnt sugar and dried apricots and peaches appear. Chubby warmth dresses for minutes the palate, still sticks a (now) pleasantly sharp film on the tongue, walnuts swim oily and slightly rancid in the saliva. On the second sip, dark caramel comes into its own before another shot of gunpowder and extremely hot pepper explode on the tongue. Gradually dark and dried fruit flavors come to light, hints of grapefruit and other citrus fruits give the taste a tart touch. The pleasant sharpness still sticks between tongue and palate, slightly decayed pieces of wood rest under the tongue, the echo now looks slightly earthy and harsh. Dark walnuts and wet leaves appear after a few moments, the aftertaste becomes tighter and wooden. An indefinable spice note sticks to the palate, the mouthfeel gets creamier, the salivation is astonishingly only now aroused in the aftertaste. Neat for his age, more PX than Oloroso character, very sweet, warm and winy. Even an impact in the mouth, but as well as in the nose, he has a little unfinished, a lot of alcohol, a lot of strength, would have taken a little more time to get down. Alkohol too dominant in the nose nevertheless enjoyable fruity sherry Note. Taste Is better as The alcohol is carrying the nice taste. Finish is Long but too wooden for me but Taste remains positive. For its money (65€) an excellent dram but to be honest I expected more. either the color or my light here is strange, I just thought, I'm tilting a Port whisky ... also touch on Oloroso ... First, sherry, not very sweet, but goes back quickly, then spices with a sour touch, woody. The alcohol bizzles a bit more here, but also goes well. The sourish goes, then come nougat and herbs. Warm up ... Yikes, that will be delicious. Gingerbread, some mulled wine, raisins, and floral Beiklang. referring to a throw-in: salty apricot in mocha I like. Can I smell ... and I have an appetite right away. Otherwise, he is sometimes quite flowery, but at the same time nutty, full. Bread with fruits. Mmh, fed, sweet, tasty, OK, a bit metallic is also, but very well covered. The alcohol is perfectly integrated. Delicious. Honey and spices. Not as complex as the nose. In the finish then nice tart notes, some menthol, honey-sweetened chocolate. Tea: Backwards the bitter thing dominates, but very pleasant. And is not so short the departure. The tasting is fun, interesting thing, always fascinating, which is possible with whisky in taste. Nice toffee and chocolate notes, but also fresh fruit notes, a fine acid, nuts and an alcohol impact. 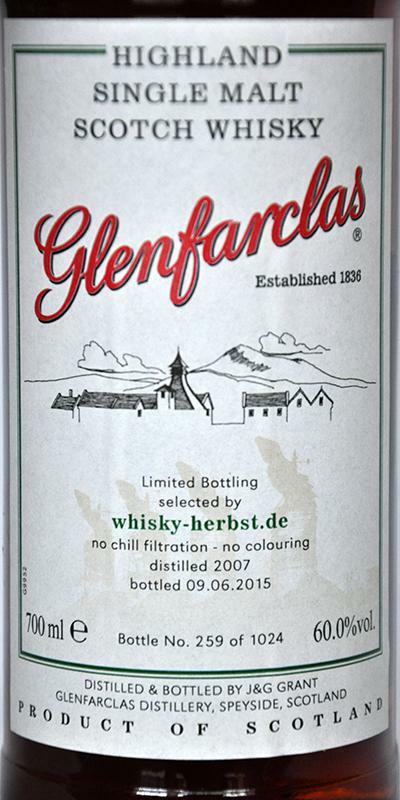 With water, the malt is fruity and younger, with some sherry, liquorice and lemon. Strong, nutty, sherry, tart oak, dark fruits, but also a lot of sharpness. It softens with water, but the tart notes also increase a bit. In addition a clear mint note. The minty note runs into the finish, with a lighter bitterness and beautiful sherry notes. In the end even some tobacco. nice mixture of a young fire and intense sherry barrel aging, maybe the whisky would have done 3-4 years more in the barrel, maybe not ... at least I would admit some water, makes it rounder. Pure: on the one hand intense sherry, a lot of chocolate, hot chocolate fountain, but next to fresh citrus fruit, perhaps originating from the youth of the bottling. This harmonises amazingly well together. With water: now both approach, it results in a red-green cherry-mint mixture, very interesting and different than usual. here a similar picture, first heavy cherry jam, milk chocolate, with lime and peppermint. Interesting! With water: even better, no longer so separated the two worlds, also here more interwoven. Class! medium, the youth catch up, the sherry stays tuned, rather dry.